From a January 16th, 2017 performance at The Huntington Library, San Marino, CA, Kristin Lee, Camerata Pacifica's Bernard Gondos Chair in Violin, and Gilles Vonsattel, piano, perform Benjamin Britten's Opus 6 Suite for Violin & Piano. Tchaikovsky's Violin Concerto in D Major at the Orquesta Sinfónica de República Dominicana, conducted by José Antonio Molina, January 13, 2017. 2015 Avery Fisher Career Grants at The Jerome L. Greene Space at WQXR on March 18, 2015. Program: Henryk Wieniawski: Variations on an Original Theme, Op. 15, with pianist Michael Smith. Kristin Lee performs Beethoven Kreutzer Sonata at Washington DC's Phillips Collection with pianist Michael Mizrahi. Kristin Lee plays Saint Saens Fantaisie, op. 124 with harpist, Bridget Kibbey at Menlo-Atherton Performing Arts Center in California as part of Music@Menlo Summer Festival. Kristin Lee gives world premiere performance of Vivian Fung's Violin Concerto with the Metropolis Ensemble and Andrew Cyr at the Angel Orensanz Center in New York City. Kristin Lee plays Eugene Ysaye's Solo Sonata No. 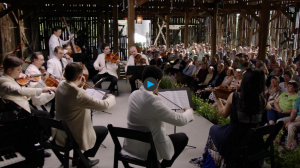 4 for WQXR's Cafe Concert Series. Find out what Kristin Lee likes to do when she's not playing the violin, her biggest influences in life, and more. Featuring Aaron Copland's Appalachian Spring, led by Kristin Lee at 58 minutes. Deciduous, commissioned for Kristin Lee in 2014. Film by Zach Nicholson. Andy Akiho, steel pan; Kristin Lee, violin.